Groups like the Guerrilla Girls, fight to ensure that women artists, both contemporary and previous, and their artwork are given equal opportunity to be considered “great” and demand equality (Frangenberg 185). One standard that groups, like the Guerilla Girls, challenge is the definition of “high art” and “low art”. Without the contributions of women artists, such as Mary Louise McLaughlin, the pottery portion of the Arts and Crafts movement would have evolved quite differently ( Zipf 141). Since ceramics is still a medium widely used by mosaic artists, women artists who create mosaics using ceramics, such as Ilona Brustad, are able to do so because of the pioneering women artists, such as Mary Louise McLaughlin, of the Arts and Crafts movement in America. Despite the Arts and Crafts movement, mosaics are still widely considered to be a “low” art form and not “great” art. 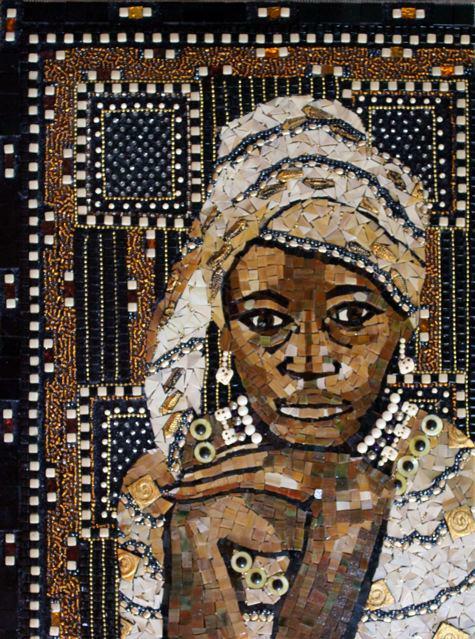 While mosaics and other mixed media art forms are still considered to be a “low” art form and are rarely considered to be “great” art, these art forms are still evolving, both in there process, impact, and appreciation. Other American women artists who have created mixed media art include Judy Chicago, Sarah Morris, and Louise Nevelson. For example, Judy Chicago's most famous piece of art The Dinner Party (1974-1979) is a mixed media artwork created from textiles, ceramics, and other mediums (Hess 83). Much like Brustad's artwork, Chicago's artwork draws on her life's experiences (Hess 78). Sarah Morris (1967- ) draws inspiration for her contemporary, fragmented paintings from daily life in New York City (Montmann 372). Louise Nevelson sculptures were inspired by her involvement with theater and dance earlier in her life (Frangenberg 389). Much like Brustad, Nevelson's art form evolved throughout the course of her life. While Judy Chicago, Sarah Morris, and Louise Nevelson may not be mosaic artists, they are all 20th or 21st century American women artists who share similar mediums for creating artwork and inspirations for artwork with Ilona Brustad. Brustad's art work is influenced namely by two artists: Henri Matisse and Ilana Shafir. When Brustad's daughter was in second grade, Brustad volunteered at her daughter’s school and became affectionately known as “the picture lady”. Brustad would bring in reproductions of art, mainly artwork by Henri Matisse, and share information about the art and the artist, Matisse, with the class (Brustad, Personal Interview). Matisse was originally educated to be a lawyer and it was not until 1891 that Matisse began to study art at Academie Julian in Paris. His work can be defined and classified by stylistic periods. For example, Matisse's painting “Woman with a Hat”, exhibited at the 1905 Salon d'Automne in Paris, gave birth to the avant garde movement known as Fauvism, a style that combines bright colors and energetic brushwork to compose the painting. His works in this style included his 1905 portrait of Madame Matisse “The Green Line” and his 1905 painting “Bonheur de Vivre” (Dabrowski 1). While Matisse may be one of Brustad's favorite artists, Ilana Shafir is a contemporary mosaic artist that has certainly significantly influenced Brustad as well. Brustad refers to Shafir as the “grandmother of mosaics” because of how much Shafir has shaped the medium (Brustad, Personal Interview). Shafir was born in Sarajevo, the former Yugoslavia, in 1924. She began her study of art at the high school for architecture but was forced to stop when Nazis invaded. Shafir and her family were forced to flee to Kula, a small village in the southern region of the country under Italian control. After the war, Shafir continued her study of art at the Zagreb Art Academy and graduated in 1949, when she moved to Israel and began to draw and paint the sadness and suffering she saw on the faces of Jews from a nearby transit camp. In the 1960's, Shafir began to move away from drawings and paintings and began to work in mosaics and watercolors. 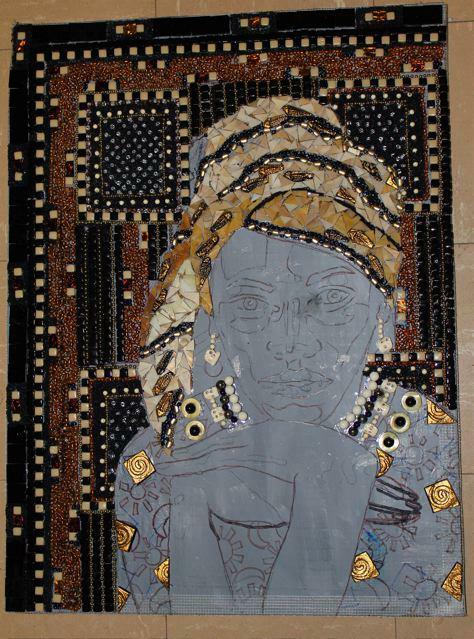 Some of her most famous mosaic works include “Gate of The Souls” which was the winner of the Curator's Choice Award at the 2002 inaugural exhibition of the Society of American Mosaic Artists, “Worlds” which was installed in 2004 at the Ashkelon Cultural Center, and “In the Deep” winner of the Best Large Scale Contemporary Work at the SAMA exhibition in Washington D.C. in 2004 (Shafir 1). Shafir's mosaic style has greatly shaped and influenced Brustad's own personal mosaic art form. Ilona Brustad was born on July 3rd in East Germany during WWII. Her parents were separated and when Brustad was five years old, her mother married an American Soldier. Almost immediately after, her mother and stepfather moved to the United States, leaving Brustad to live with her grandmother. Brustad describes the separation from her mother as “traumatic” but it was not long before she became very close with her grandmother. Brustad remained in Germany with her grandmother for four years, before she moved to the United States to be with her mother and stepfather. She describes leaving Germany as another traumatic time in her life, as she had grown so close to her grandmother (Brustad). Though leaving Germany was difficult, Brustad loved the U.S. almost immediately and thought the schools were wonderful compared to her schooling in Germany. She recalled a negative school experience that occurred while she was still living in Germany and described how teachers forced her to write with her right hand even though she was naturally left handed. The lessons from her past have stuck with her and she still writes and draws with her right hand, but she does almost everything else left-handed. Despite such experiences, Brustad gracefully overcame the obstacle of moving to a foreign country and adapted well to life in the U.S (Brustad). Brustad has had a very extensive and well-rounded education. She was greatly inspired by her English teacher in High School and therefore, started her education at Wayne State University where she to pursued a combination degree in English and Education. Brustad graduated from Wayne State and with her degree taught English for three years, although she was terrified of being in front of the class. She then went on to study Art as a hobby at Wayne State University where she ultimately decided to continue her education, and after ten years Brustad had obtained her Bachelor of Arts degree in Art. After moving to Ann Arbor in 1987, Brustad continued her education by attending Eastern Michigan University to earn a master’s degree in teaching English as a second language (Brustad). With this degree Brustad taught at Washtenaw Community College for twelve years. Although she still had anxiety about being in front of the classroom, she overcame that fear every day to continue this career. After completing twelve years at Washtenaw Brustad retired and devoted her time to art (Brustad). Though Brustad has been a dedicated student, teacher, and artist, she still found time to marry and have children. She became a devoted wife and mother for years as she raised her three children. Brustad would volunteer from time to time and would work on her art whenever she had a spare moment. It wasn’t until after Brustad and her family had moved to Ann Arbor, Michigan and her children had grown, that she spent the majority of her time working on her art (Brustad). Brustad started her art career in painting and she spent most of her time doing that while attending different workshops involving different types of art. Brustad joined multiple organizations, such as Ann Arbor Women Artists and Chelsea Painters, and she currently remains a member of these organizations. Brustad’s first public appearance as an artist was in the late 1970’s, while she was living in Birmingham, Michigan. She exhibited her art as part of the Birmingham Bloomfield Art Association for her first appearance. After starting as a painter, Brustad attended many workshops to improve her artistic abilities. An important one was on mosaics on a Saturday afternoon, during which Brustad decided that was the direction she wanted to go with her art. 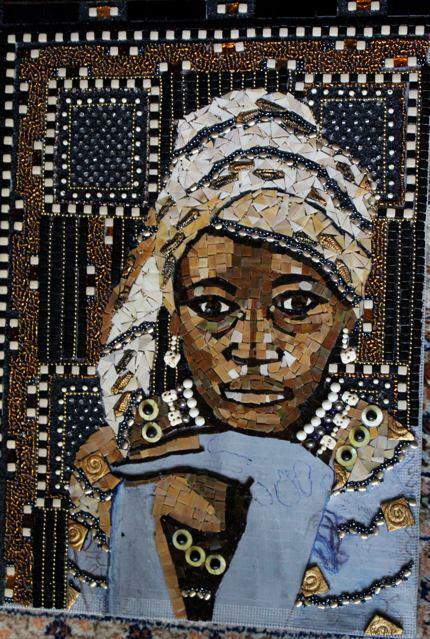 Since then she has been creating mosaics rather than painting. Although mosaics were a very different medium, she immersed herself in this art form and has been very successful (Brustad). The one downfall that Brustad mentioned about being a mosaic artist as opposed to a painter was that fellow artists have a bias against mosaic artists, considering mosaic art to be a craft rather than an art. Though she has struggled with discrimination based on the mosaic art form, Brustad did not see a gender bias in mosaics that she observed as a painter; she would sign all of her paintings as I.M. Brustad rather than Ilona, because she worried she would not be taken seriously as a female painter. Despite judgment from fellow artists, Brustad still continues her career as a mosaic artist, and is still exhibited at many different places throughout Michigan (Brustad). Brustad’s most recent series, “Women of Substance,” features African women and is meant to represent women from around the world. 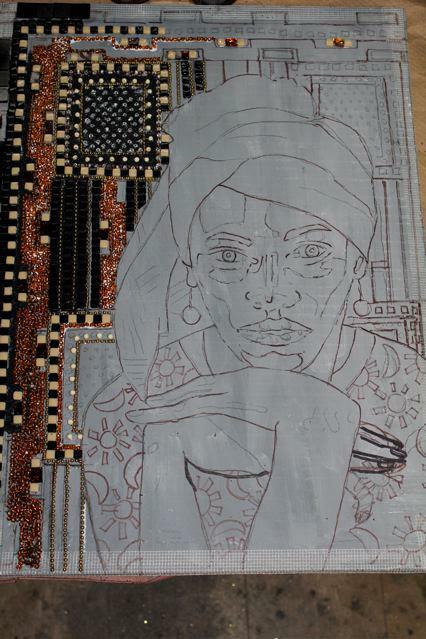 Brustad was inspired by African headdresses and fabrics and has so far completed three mosaics for the series. The first mosaic of the series remains untitled, her second is “Girl in a Blue Head-Wrap,” and her third is, “Remembering.” Brustad’s “Women of Substance” series has been a great success so far and she won first place in the Huron Valley Council for the Arts' annual juried exhibit, "Views and Visions" for “Girl in a Blue Head-Wrap.” Currently, Ilona Brustad lives in Ann Arbor, Michigan with her family and has committed herself full-time to mosaics and continues to work on her latest series (Brustad). In conclusion, although there are struggles with any field of work, it is important to push through those barriers like Ilona Brustad has. 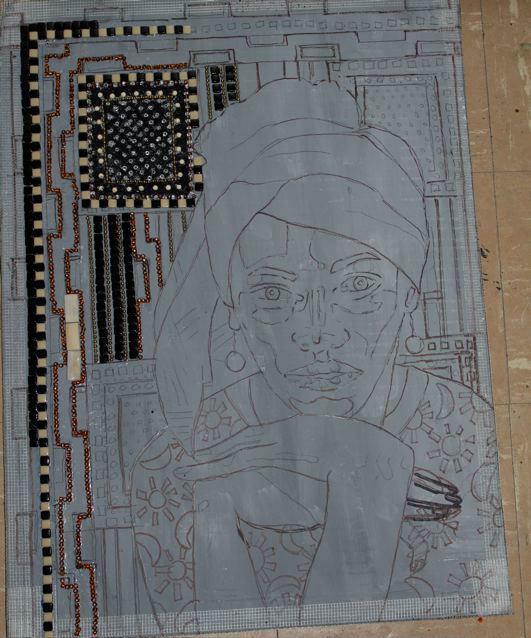 The process of making a mosaic piece is a lot more complex than most would think. It requires a lot of time, patience, strategy, effort, strength and creativity. What some may consider to be a simple craft becomes a lot more elaborate when the procedure is broken down step by step. History has proven that the art world in general is difficult to make a mark into, specifically for women, but it is women like Ilona Brustad, who do not allow the general public to alter their perception on what they should be doing versus what they want to be doing, that are helping to change this. Ilona Brustad is the epitome of a hardworking artist.